Things that aren't made of plastic, wood or glass are all squished together on this page. If it's wood, plastic, fishing gear or glass you're looking for, please feel free to click on the links. It is not unusual for single sheets of rubber or bales of rubber sheets to wash up. They are part of the process of producing rubber. 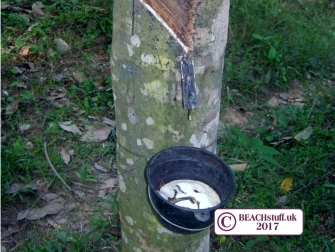 Below right, pictured in Thailand, is the collection of rubber (in the form of latex) from a rubber tree. 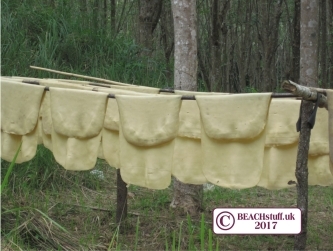 Below right, also in Thailand, the freshly gathered rubber, having been pressed into sheets, is hung up on lines in the sun. Sometimes whole bales of rubber sheets tightly packed together wash up. 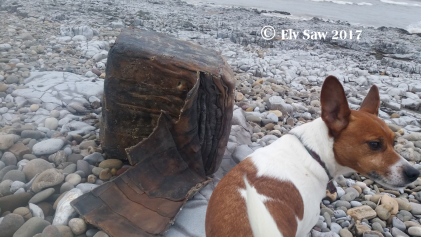 Many thanks to Elv Saw (and her dog) fo rthis fine photo. Occasionally, sheets will have a name stamped into the rubber. It can then be possible to trace where it came from and when. Some can be a hundred years old or more. Misshapen waxy or oily lumps are not unusual on the strandline unfortunately, These are often caused by hot oil being poured in the sea which then instantly solidifies as it cools. 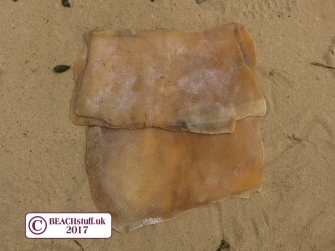 When lumps of palm oil turn up in this way, it can be harmful to dogs if they eat it. 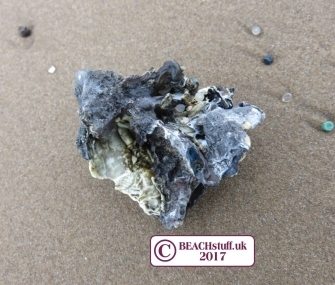 Of course, it could also be surf wax ... and maybe even ambergis (whale vomit) which could be worth a small (smelly) fortune. This huge piece of rubber was far too heavy to pick up. Measuring about one metre by half a metre, it has these distinctive ridge running along its length. What could such a piece of rubber be used for? 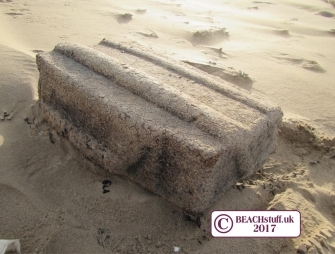 How did it end up on the beach? Email hello@beachstuff.uk and I'll feature the best. Use the same email if you want to send in your own challenges.